Thanks to a last minute donation from a very generous supporter we reached our mini-goal of $80,000 by midnight Christmas Eve. That immediately kicked in $6,000, which was pledged to us if we met that mini-goal. It was a huge morale booster for the whole FAN team when this “impossible” goal was reached and we thank the many supporters who helped us reach it. He will double each donation for the next $1,000 donated and he will double each donation up to $ 4,000 if and when we get to $90,000. Now we are looking for pledges to be added if and when we reach $100,000 to ease us down the last stretch. NOTE: We have received many enquiries from supporters as to how to access back issues of this bulletin. You will be happy to know that they are all being archived here. With all the new information of cover-up and collusion between US Public health officials and the industries using or producing fluoride emissions being dug up by Michael Connett, and the revelations in David Kennedy’s new DVD “Fluoridegate” it is intriguing to revisit another example of fraud in the promotion of fluoridation – this time from New Zealand. 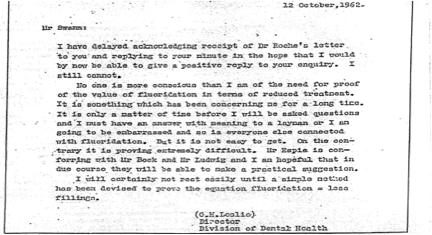 This NZ fraud begins with a smoking gun letter (dated Oct. 12, 1962) from G. H. Leslie the director of NZ Government dentistry – who EIGHT years into the 10-year Hastings-Napier trial (1954-64) complains that they cannot find the evidence to convincingly demonstrate a relationship between fluoridation and lower tooth decay. It is amazing to me that people in NZ who have been made aware of this letter and its aftermath still “believe” in fluoridation and blithely continue to trust NZ dental health officials. But for how much longer? With this letter we have what amounts to a “smoking gun” as far as the inability of NZ dental officials and researchers to show the effectiveness of fluoridation – some eight years into the ten-year Hastings-Napier fluoridation trial. The Mr. Ludwig, who Leslie refers to, is the lead researcher for this trial. However, miraculously, two years later this trial was proclaimed a great success in demonstrating that fluoridation resulted in a large reduction in tooth decay (over 60%) and the result was used to push for fluoridation throughout the country. So how in the space of two years was this dramatic turnaround achieved? The answer came from the late Dr. John Colquhoun, the former Chief Dental Officer for Auckland, who after retirement did a PhD thesis on the history of fluoridation in New Zealand (Colquhoun, 1987). As part of his doctoral research he was allowed access to the official files on the Hastings-Napier trial (though according to his thesis advisor Professor Robert Mann, it became evident that some were incomplete, especially regarding Napier). Based on these official files he was able to see how the deception was orchestrated. In his thesis and in an article published in The Ecologist (Colquhoun and Mann, 1986) he showed that the massive reduction in tooth decay claimed for Hastings was a complete artifact. 1) After about two years the control city of Napier was dropped for bogus reasons. 2) The reduction in tooth decay claimed was based on comparing tooth decay in Hastings at the beginning and the end of the trial (and not a comparison between tooth decay in Hastings and Napier). 3) The method of diagnosing tooth decay was changed during the trial. Before the experiment they had filled (and classified as “decayed”) teeth with any small catch on the surface, before it had penetrated the outer enamel layer. After the experiment began, they filled (and classified as “decayed”) only teeth with cavities, which penetrated the outer enamel layer. I would be anxious to hear from anyone who can persuade us that the whole fluoridation program in NZ was not based on fraud. In a few days we will be publishing a Summary report from New Zealand for 2013 by Mary Byrne, FAN-NZ and tomorrow Michael will be updating us on FAN’s Flash Drive project. Colquhoun J. and Mann R. 1986. “The Hastings Fluoridation Experiment: Science or Swindle?” The Ecologist 16, no. 6: 243–48. Colquhoun J. 1987. “Education and Fluoridation in New Zealand: An Historical Study,” Ph.D. diss., University of Auckland, New Zealand.